Louis Bunce was one of the Northwest’s most well-known artists of the 20th century. 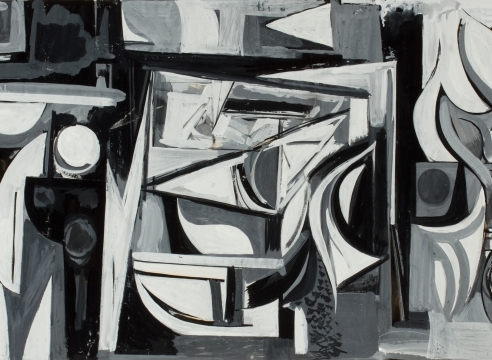 While he taught and made his home in Portland, his work was exhibited on both the east and west coasts, and he routinely spent time in New York, absorbing the energy of the surrealist and abstract expressionist movements. This exhibition shows the role of surrealism in the evolution of Bunce’s own work. Curated by Laura Russo Gallery artist Jack Portland, who was a student and long time friend of Bunce, the show features works on paper that were stored in the archive of the estate, and have not been exhibited for decades. One of the Northwest's most well-known artists, Louis Bunce studied at the Arts Student League in New York during the 1920's where he was influenced by the major pictorial styles of the 20th century. He began exhibiting in 1937 on both the east and west coasts and was honored in 1979 with a retrospective at the Portland Art Museum. In the 1950’s, he completed a major mural for the Portland International Airport, which is still installed today. As a teacher at the Pacific Northwest College of Art from 1946-1972 Bunce had a strong effect on the region’s painting and many of the young artists who came out of the school. His work is in numerous collections including the National Gallery in Washington D.C., the Whitney Museum and the Metropolitan Museum in New York, the Philadelphia Museum, the Newark Museum in New Jersey, the Victoria Museum in B.C., the Seattle Art Museum, and the Portland Art Museum in Oregon. The Hallie Ford Museum of Art in Salem, OR is developing a retrospective exhibition for 2017.